In this photo Sébastien was organizing the workshop at the Weed Club in Zarautz, Euskadi (Basque country) with the Weed Club team and Franco from Strain Hunters & Green House Seeds. Alpha-CAT works with dispensaries, cooperatives, collectives and legal cannabis growers from all over the world. 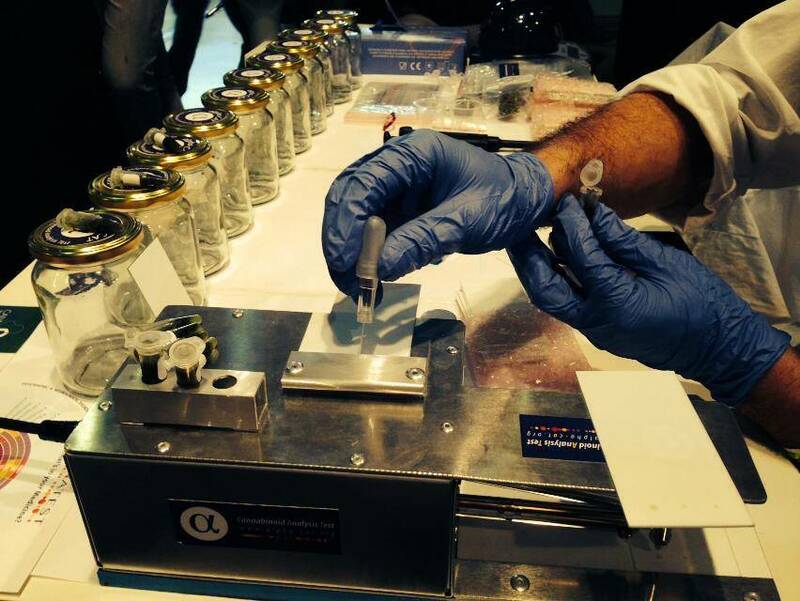 Our test center in Praha (Czech Republic) use the alpha-CAT TLC (Thin Layer Chromatography) cannabis testing method. 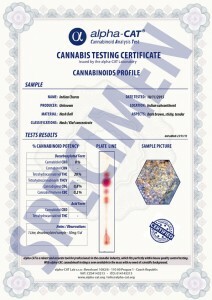 Alpha-CAT has supplied the alpha-CAT TLC cannabis testing method to several labs throughout the world. * 600 € / Tutorial (10 pers max- testing materials and travel costs not included. 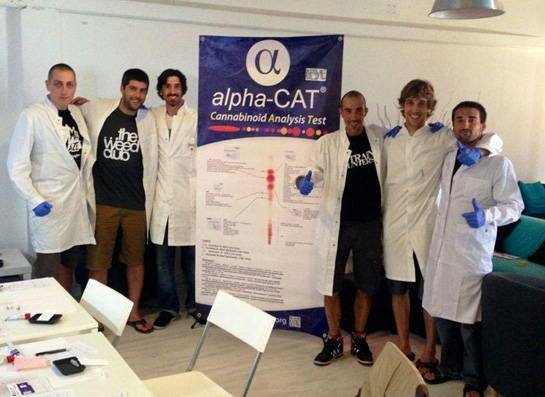 ** You’ll need at least one alpha-CAT MINI Test Kit (60€) / participant, they should be ordered before tutorials, contact us to established a quotation and plan a personalized alpha-CAT training session. After each tutorial training, you will receive a personalized alpha-CAT attendee certificate. Your certificate of attendee, will prove your testing skill to operate alpha-CAT techniques properly with correct result interpretations.The participants will be tested with an open book multiple question form, to make sure they know the fundamentals, . A trained alpha-CAT technician is highly valuable to an organization who wants to master in house cannabis quality control. Alpha-CAT certification services can only be dispensed by an organization with an individual who have succeed, the alpha-CAT tutorial programs Level 1 and 2. In addition, it is mandatory to be equipped in house with an alpha-CAT test kit, an alpha-CAT heating device, a high precision scale ( > 0,001g), a micropipette (1ml > 1ul), a digital microscope (x600 > x200) and the 6 main cannabinoids calibration charts. (CBD, CBN, THC, THCV, CBG, CBC). Be aware of copycat ” : We reserve the right to recall an entity who did not passed the tutorials up to Level 2, with or without the basic required equipment to issu official testing service according to the alpha-CAT testing standards.